Currently last in the team standings, Sergey Sirotkin the only driver still to open his 2018 points account, it's fair to say that this season is looking likely to be the worst in Williams long history. However, Claire Williams has leapt the defence of drivers Sirotkin and Lance Stroll, claiming that even Lewis Hamilton would struggle in her team's 2018 contender. "Put Lewis in our car, and I'm not sure he could have made a huge amount of difference," she tells the BBC. "I feel sorry for Lance and Sergey. The car just doesn't have the performance," she adds. "They are young but there is often criticism of teams for not nurturing young talent. They have had an enormous amount of criticism levelled at them, and that is somewhat unfair. "They have not been able to show the talent they do have and we wouldn't put drivers in the car if we didn't think they had some talent. I don't think any driver could have made that much difference to our performance." Race after race the drivers complain of poor balance, things coming to a head at the team's home race - ironically the scene of its first ever Grand Prix win - Silverstone, where an anomaly with the rear wing, Paddy Lowe later described as a "DRS-related phenomenon", left both drivers starting from the pitlane, subsequently finishing the race last. "You don't go from P5 to P10 without a number of issues in play," insists Williams. "It is obvious our aerodynamics are not where we need them to be. That was one of the key areas we went aggressive and we got it wrong. "But we have confidence in the team we have that they can deliver what we need them to do over the next few months and next year we have changing aero regulations which will hopefully reset things and provide a baseline platform we can take advantage of. "There are other issues at play but airing your dirty laundry in public is not something we do here," she adds. "We have a job of work to do to make sure we have the right people and processes in place and the right resources. The situation has given us the opportunity to dive deep and make adjustments where we need to and come out stronger in the future. "We have held our hands up and said we have got it badly wrong," she says. "But that happens in sport. We have been through this scenario many times and we have got out of it many times. We won't give up. We are fighters and we won't stop fighting until we get back to where we need to be. "Everyone is very much focused on getting us back to the top of the midfield again. It is heart breaking and soul-destroying for everyone in this team. Everyone feels the pain, not just me." Set to lose title sponsor Martini at the end of the season, the team is also likely to lose Stroll, his father strongly linked with a buy-out at Force India. 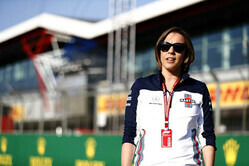 Indeed, at a time Force India goes into administration, Williams has made no secret of the fact that without the planned budget cap and redistribution of the prize pot her team will struggle to survive. Check out our Saturday gallery from the Hungaroring, here. "Not sure I agree, Ryan. 2011 and 2013 were disaster seasons - and TD's resigned after both. Curiously, they were both followed by seasons in which they produced particularly strong cars. Williams scored 4 and 5 points in these seasons and are currently on 4. 2006 was a shocking year in terms of reliability. 2008 started with a podium and then went backwards. 2009 was a good car let down by Nakajima. They have indeed been up and down ever since BMW days." ""We have been through this scenario many times"
No, they haven't. This is the only time Williams has ever performed this badly."